Background & Objective : Single port surgery has widely spread and many technical studies have been reported in the past few years, including parallel and cross hand method, direct insertion of trocar and using SILS port, straight hand and the curved hand instrument, But there is little agreement on the standard technique. The standard technique in single port surgery needs to be examined in detail. 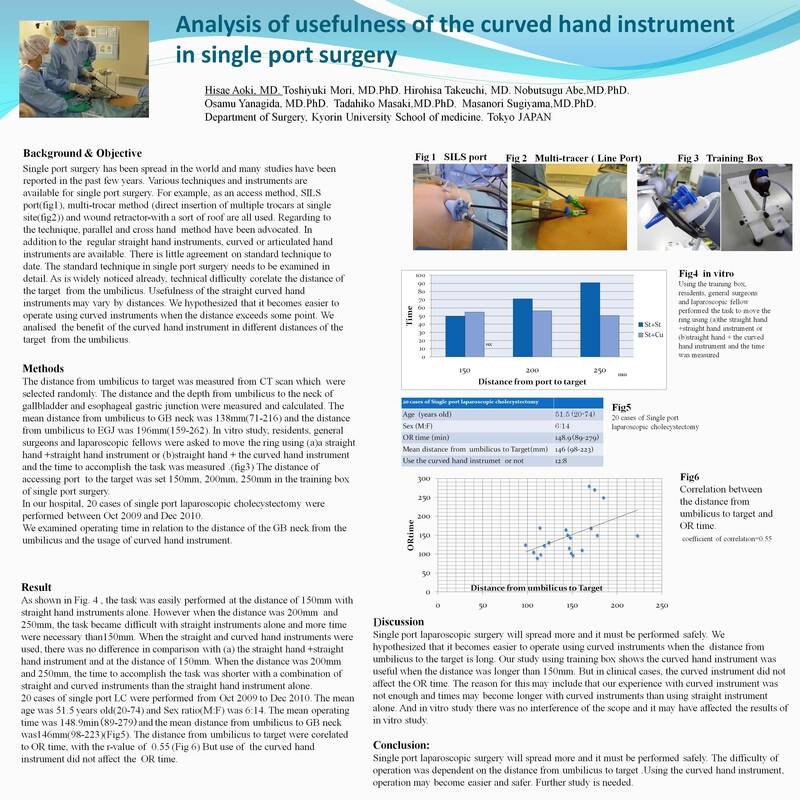 Analysis of usefulness of the straight instrument or the curved hand instrument in different situations may be the key to solving one of the problems. We analysed the benefit of the curved hand instrument in different distance from the umbilicus to the target. Methods: The distance from umbilicus to target was measured from CT scan which were selected randomly. The distances and the depth from umbilicus to the neck of gallbladder and esophageal gastric junction were measured and calculated 150-250mm. Then in the dry box study, the distance of umbilicus port to the target was set up 150mm, 200mm, 250mm in the training box of single port surgery. Using the training box, residents, general surgeons and laparoscopic fellow performed the task to move the ring using (a)the straight hand +straight hand instrument or (b)straight hand + the curved hand instrument and measured the time. Result : The mean distance from umbilicus to neck of GB was 137mm(70mm-216.2mm) and the mean distance from umbilicus to EGJ was 195mm(158mm-262.3mm). Using training box , (a) the straight hand +straight hand instrument were used and when the distance was 150mm, the task was performed easily. But when the distance was 200mm and 250mm, it become difficult to do the task and required time were longer than in 150mm. (b) When the straight hand + the curved hand instrument were used and measured the time. When the distance was 150mm, there was no difference in comparison with (a) the straight hand +straight hand instrument. But when the distance was 200mm and 250mm, the time of doing the task was faster in straight and curved hand combination than (a) in the straight hand +straight hand instrument. Conclusion: Single port laparoscopic surgery will spread more and it must be performed safely. In this study, if the distance from the umbilicus to the target were longer than mean distance, we suggested to use the curved hand instrument and operation may become easier and safer.